Sometimes the most dramatic scenes in a high school theater club are the ones that happen between the actors and crew off stage. Seventeen-year-old Tyler Darcy's dream of being a writer is starting to feel very real now that he's sold his first short story to a literary journal. He should be celebrating its publication with his two best friends who've always had his back, but on this night, a steady stream of texts from his girlfriend Sidney keep intruding. So do the memories of his dream girl, Becky, who's been on his mind a little too much since the first day of high school. Before the night is over, Ty might just find the nerve to stop all the obsessing and finally take action. This is my first Tom Leveen novel and I am head over heels for his writing. You can bet after reading this slim but superb novel about a young man chasing a vision of what he wants instead of appreciating what he has that I will be adding Leveen's other novels to my shelf. Manicpixiedreamgirl opens on Tyler Darcy and his friends Rob and Justin celebrating after Tyler sells a short story to a literary magazine. After three years of pining for Rebecca, Tyler's forced to decide whether it's time to act or time to move on. I can't say enough about this book. It's 256 pages of real people with real emotions, actions and reactions that is nothing short of absolutely compelling. Every character is unique and steps outside of some of the stereotypical teenage characters you see in fiction. For example, Tyler's friend Rob is constantly evolving, changing his look and trying new things but never trying to become someone else. Vignettes that showcase this evolution are a testament to the teenage search for self that everyone goes through in high school. Voice is the thing that gripped me most about manicpixiedreamgirl. Tyler tells his story as it happened. For the most part it's his unembellished, true account of what happened down to his self-doubt and reflection on his actions or lack thereof. His honest review of his past during a single day of his present is what made this novel so difficult to put down. Tyler's obsession with Rebecca is lost on his girlfriend and two best friends. Rob and Justin wonder why Tyler put her on a pedestal and why he hasn't given up the dream, especially when Sydney is right in front of him. Sydney is convinced that maybe Tyler will eventually realize what he has. All he needs is time and she's willing to be patient, but that day might be further away than Sydney thinks. 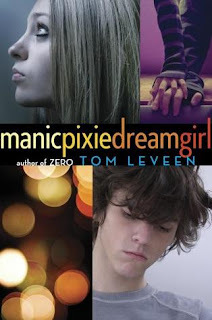 If you're looking for a fantastic read that nixes the melodrama of high school and overblown archetypes associated with it then your search ends with manicpixiedreamgirl. Simultaneously quick-witted and achingly real, Leveen's latest work is not to be missed. This really appeals to me to because I was in the theater club (er, stage crew), so I want to see how Leveen portrays high school theater. Out of curiosity does this book actually feature a a manic pixie dream girl ? Yes. Rebecca is the manic pixie dream girl. She's the unattainable figure that seems perfect in every way.